8-1/2" x 11", softcover, 18 pages, $29.95. Today, more than ever, distribution professionals are being asked to trim warehouse costs while providing an ever-increasing level of customer service and quality. Think youve wrung all of the costs out of your warehousing or distribution center operation? Take another look — even in the best-run operation, theres generally still room to cut costs. And you simply cant afford to postpone cost-cutting efforts. Companies in the past may have had patience with under-performing or ineffective facilities, inefficient methods of storage, or less than optimal levels of productivity. But for most, this is no longer an option. In 45 Proven Ways to Cut Warehouse Costs youll find actionable ideas you can use today to cut costs in the warehouse and distribution center. To prepare this report, the editors of Distribution Center Management newsletter talked with over a dozen DC managers and warehousing experts. 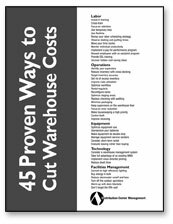 45 Proven Ways to Cut Warehouse Costs includes their best suggestions, grouped into five categories: Labor management, operations, equipment, facilities, and technology. Any one of these ideas can produce thousands of dollars in savings. However, when combined into an overall cost-containment program they can often reduce costs by two, three or four times that amount. And with this fast-read, actionable report, youll be able to put those techniques to use right away. 45 Proven Ways to Cut Warehouse Costs was compiled and edited by the editors of Distribution Center Management newsletter. 45 Proven Ways to Cut Warehouse Costs is guaranteed. If you are not 100% satisfied, simply return it within 30 days for a complete refund.